The Disaster Management Team is yet to provide any update on the incident or announce a rescue plan since it happened on Sunday this week. When contacted on Tuesday, the Disaster Management Team told FrontPageAfrica that they were unaware of the disaster. 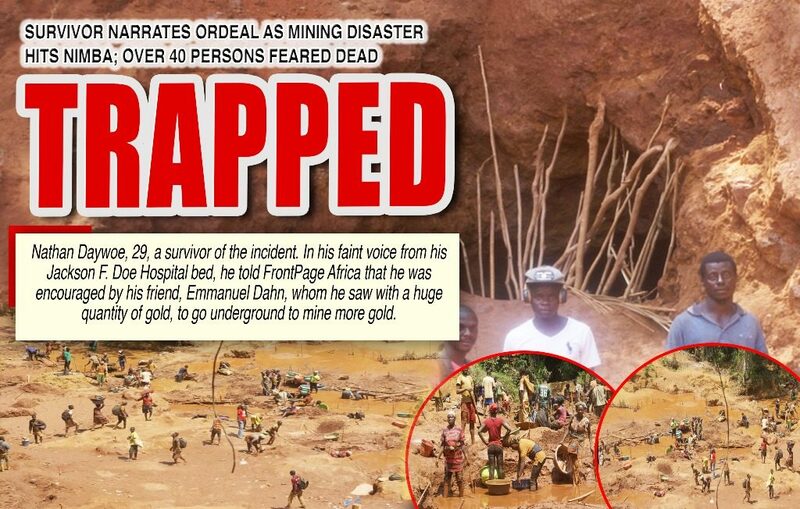 FrontPageAfrica gathered that prior to Sunday’s incident, 12 persons lost their lives in similar manner at the mine. Our contributor further said the Kartee Gold Mine was ordered closed by local authorities in Tappita last month following reports of mass deaths of illicit miners in the area, but the warning was said to have been ignored and mining activities continued unabated in the areas. Our contributor was told that these unskilled miners take risk by under-digging the ground without putting a very good braces to uphold the top flood as they dig further into the earth. According to our Contributor, no arrest has been made and illegal miners can still be seen in the areas. Nathan Daywoe, 29, a survivor of the incident. In his faint voice from his Jackson F. Doe Hospital bed, he told FrontPage Africa that he was encouraged by his friend, Emmanuel Dahn, whom he saw with a huge quantity of gold, to go underground to mine more gold. Daywoe was lucky to have survived. While down the mine, he was sent by his colleagues to buy food and water for the rest of the group. 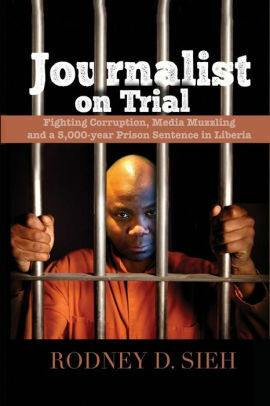 He explained to FrontPageAfrica that upon his return, as he entered the mine, he suddenly felt the heavy downpour of mud and other debris on his chest. He fell to the ground with most of his body stuck under the mud. He was rescued by other miners who were carrying out their mining activities outside. Other survivors who were taken to the hospital fled the hospital fearing that they would be arrested after their treatment for illegal mining. According to media reports, G. Odafor Kartee, a member of the family that owns the land where the Gbanepea gold mine is located, expressed concern over the influx of young men who are involved in mining activities. Kartee told the Daily Observer this is the third time such an incident had taken place in the area, and had killed people since the mine was open in late September, 2018. He explained that gold was discovered in the area in the early 1930s. However, reports reaching FrontPageAfrica from the county says the statutory superintendent of the district has ordered the arrest of Kartee for illegally operating the mine. According to reports, the mine has been given to a company that expressed interest in carrying mining activities there, but is yet to commence operation. Kartee is still on the run. In August 2015,14 men illegally mining for gold west fell victim to a landslide. They were trapped under rubble. The miners, all from Sierra Leone, had reportedly dug a deep hole near Liberia’s border with their Sierra Leone and were buried in a landslide. Hundreds of people from Sierra Leone cross the border into Liberia to illegally mine in the mineral-rich Gola Konneh District. Gold, Liberia’s Possible Economic Savior? At a press conference in June 2018, Deputy Governor of the Central Bank of Liberia, Samuel Wonwi Thompson said the crippling effects of the economic downturn Liberia is faced with can be alleviated should the government rigorously control and manage the extractive industry, especially the gold industry. Mr. Thompson called on President George Weah and his lieutenants to put stringent measures into place to properly regulate the sector, which he believes will help to bridge the current balance of payment gaps Liberia faces. Many, especially economic experts, agree that the Liberian economy, which is heavily import dependent, could fare better if the country can add value to and increase the volume of its exports, mainly processed or semi processed products. This, according to him, will help ensure a favorable and healthy balance of payment regime. Economic experts believe stronger regulatory measures should be applied particularly to gold which, according to Thompson, is being air-lifted by helicopter out of the country as gold bullions by the Bea Mountain Mining and the Millennium Gold corporation. He noted that the gold industry could be that magic wand that could help stabilize the economy by bringing in the needed foreign exchange for the time being to strengthen the country’s balance of payment as the government strives to invest in long term solutions such as the agricultural sector and industrialization. He alleged that Avesoro or Bea Mountain Mining Corporation (formerly Aureus Mining) and the MNG gold mining companies are producing and flying significant quantities of gold bullion out of Liberia every week by helicopter while our currency continues to depreciate. “The highly secretive way this was done in Liberia with those mining concessions suggests that we the Liberian people are being shortchanged of significant foreign exchange benefits from our God-given heritage, by a few greedy and corrupt persons,” he said. “God has blessed us with several large gold deposits, but we learned from the Panama Papers about the alleged use of “bearer shares” by certain government officials and their cronies, to hide their ownership of gold mining company shares plus other illicit payments in offshore tax havens,” he said. From a combined investment of at least US$500 million, the IMF estimates that the value of gold exports will average between US$200 million to US$300 million every year from the Liberian gold mines. This excludes the Hummingbird gold concession in Southeast Liberia that was recently rejected by President Weah. The customs department of the Liberia Revenue Authority (LRA) on February 4 uncovered a major tax evasion scheme at the Roberts International Airport involving a Lebanese national named Mr. Hassan Aidibi. Mr. Aidibe was arrested by customs at the Robert International Airport (RIA) while attempting to board Royal Air Maroc flight with a briefcase containing gold. The exporter processed a Customs Declaration at the Ministry of Lands, Mines & Energy for 97.94 ounces of gold at a current market value of US$95,876 and made a 3% royalty payment of US$2876 into the General Revenue Account. “However, our Anti-Smuggling investigators found out that the actual gold being exported by Mr. Hassan Aidibi was 56 kilograms or over 1900 ounces valued at over US$2 million. The royalty on the gold under seizure is estimated at over US$50K.